Zebra Danios (Danio rerio) are a spirited and entertaining freshwater species that are inexpensive and great for beginner aquarists. At a max size of 2″, they work well with smaller tankmates such as Neon Tetras and Swordtails. Keep reading for everything you need to know about keeping Zebra Danios in your own aquarium. This caresheet is a guest post by Jacques from DragonSearch.com! Danio rerio, commonly Zebra Danio, Striped Danio, or Zebrafish. In the wild, Zebra Danios are found in the Ganges region of Eastern India, Bangladesh. Some populations have also begun to appear in the wild in the USA waters, as they escape breeding facilities or are “set free” by pet owners who no longer want them. Technically a cold-water fish (preferring temperatures of 68°F-72°F), Zebra danios thrive in streams, ponds and rivers. However, pet-store strains of this species have been heavily inbred and have become less tolerant of colder temperatures. In the aquarium, Zebra Danios are curious fish who love to race around and explore caves, cubby holes, and the ins and outs of clusters of aquarium plants as well as interacting with other schools of fish in the aquarium. They’re a great, fearless fish to get if you love watching your fish being active and interesting. This is a highly social species, so it’s best to create a school of six to eight or more – they can be nippy with each other in smaller numbers. Zebra Danios are smaller, up to 2″ (5cm) in size, with stripes horizontally along their bodies. If you look carefully near their mouths, you’ll be able to spot two tiny whiskers. Male Zebra Danios can be spotted by the five dark blue-purple bands on their body, with gold in between. Females of the species are silver with five dark blue-purple bands, and have larger and much more plump bodies when they reach maturity. 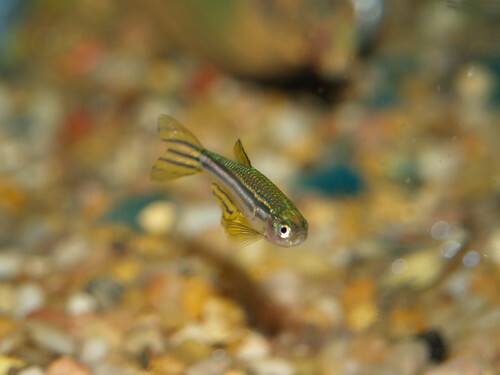 One common variant, Danio frankei (also known as the Leopard Danio) is usually considered a variant of Danio rerio and not a true species of its own. When purchasing Zebras, you’ll often find a Leopard Danio or two mixed in, or something halfway in between. Other varieties include the long-finned veiltail variants with their long, beautiful flowing tails, and a rarer albino variety. Also becoming very popular today is the genetically modified, trademarked variety known as the Glofish™, which glow brightly under a black light and come in many vivid colors. Zebra Danios are very hardy and resilient, which, combined with their low cost in stores, makes them an excellent starter fish. They love well-planted aquariums but also need large, open swimming areas, preferably near the top of the water, as they like the skim along just below the surface. They love moving water and are not too demanding when it comes to water cleanliness, though the aquarium should always be cycled. Their high-energy personality does better if you calm them with diffused lighting. 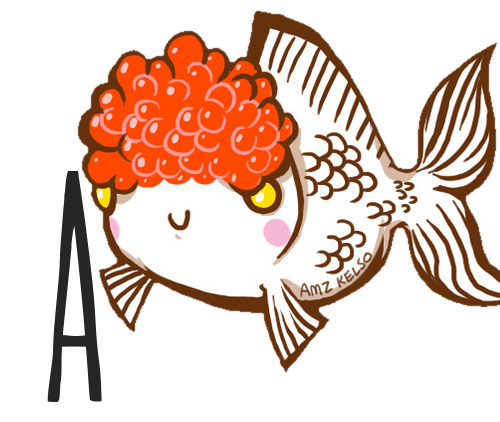 Be sure to keep a good lid on the aquarium, as they can be jumpers! A healthy, genetically-strong Zebra Danio will live two to three years on average, and up to five in exceptional cases. If you have slow-moving or docile fish, the fast-moving, robust Zebra Danio may stress them out, so avoid mixing them with fantail guppies, Siamese fighting fish, and similar slower-moving varieties. Zebra Danios, when bought from a breeder are coldwater fish and prefer moving water, pair very well with White Clouds, which are also a very hardy species that likes colder, faster-flowing water. Danios are not picky eaters but a little high-quality food can go a long way with them. Feed them vitamin-rich granules or flakes or high-quality frozen, freeze-dried, or live foods. They also particularly love fresh vegetable matter and brine shrimp – live or frozen. One little-known fact about this species is that Zebra Danios mate for life – even if the other mate dies, they do not look for another. If you find you have a breeding pair, try to learn which two are the match, so they can be paired with each other if you decide to isolate them for breeding purposes. Prepare a 20-30 gallon aquarium with fine-leaved plants, with a mesh screen over a bottom that is either bare or has large rocks or marbles. You can protect the eggs in advance by treating the aquarium with a fungicide, which is a major killer of the eggs. Increase the water temperature to 78°F, then place both the male and female in the aquarium. When ready, the female will drop 200-800 eggs, letting them fall through the mesh bottom as the male fertilizes them. Once the breeding is complete, remove both parents, as they will eat the fry (newly hatched fish). The fry will hatch within two days, and can be fed up to seven times a day with Infusoria or a commercial fry food. If you have access to live food such as Daphnia or newly hatched brine shrimp, these options are ideal. Fish will take several months to grow, and should be transferred to larger aquariums as they outgrow their current environment. Zebra Danios can be found in any pet store, small and large. Premium breeders are online, and can quickly and safely send you Zebras or other fish by mail, typically with no casualties at all, if you’re willing to pay high shipping costs to get better fish. You can buy Zebra Danios here! If you have any questions at all about Zebra Danios, we’d be more than happy to help you out! Leave your questions in the comments below, and we’ll be sure to check in often to share our advice, and help you enjoy the hobby to its fullest. DragonSearch: We love pets, especially freshwater fish! Find us online at DragonSearch.com, or at our Twitter account at DSFido! Very informative! While I’ve never had zebra danios, just neon tetras and orange mollys, an article like this would have been a big help.